The MSF process is composed of a series of elements, called stages. In each stage, condensing steam is used to pre-heat the seawater feed. By fractionating the overall temperature differential between the warm source and seawater into a large number of stages, the system approaches ideal total latent heat recovery. Operation of this system requires pressure gradients in the plant. The principle of operation is shown in Figure 8.4. Current commercial installations are designed with 10-30 stages (2°C temperature drop per stage). A practical cycle representing the MSF process is shown in Figure 8.5. The system is divided into heat recovery and heat rejection sections. 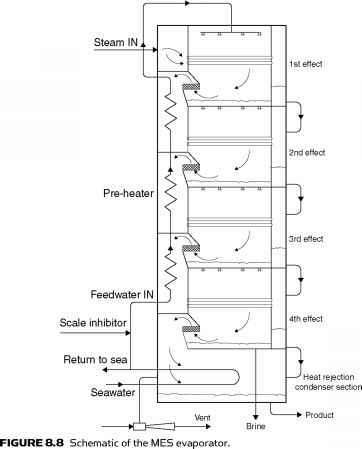 Seawater is fed through the heat rejection section, which rejects thermal energy from the plant and discharges the product and brine at the lowest possible temperature. FIGURE 8.4 Principle of operation of the multi-stage flash (MSF) system. FIGURE 8.5 A multi-stage flash (MSF) process plant. The feed is then mixed with a large mass of water, which is recirculated around the plant. This water then passes through a series of heat exchangers to raise its temperature. The water next enters the solar collector array or a conventional brine heater to raise its temperature to nearly the saturation temperature at the maximum system pressure. The water then enters the first stage through an orifice and, in so doing, has its pressure reduced. Since the water was at the saturation temperature for a higher pressure, it becomes superheated and flashes into steam. The vapor produced passes through a wire mesh (demister) to remove any entrained brine droplets and then into the heat exchanger, where it is condensed and drips into a distillate tray. This process is repeated through the plant because both brine and distillate streams flash as they enter subsequent stages that are at successively lower pressures. In MSF, the number of stages is not tied rigidly to the PR required from the plant. In practice, the minimum must be slightly greater than the PR, whereas the maximum is imposed by the boiling point elevation. The minimum interstage temperature drop must exceed the boiling point elevation for flashing to occur at a finite rate. This is advantageous because, as the number of stages is increased, the terminal temperature difference over the heat exchangers increases and hence less heat transfer area is required, with obvious savings in plant capital cost (Morris and Hanbury, 1991). MSF is the most widely used desalination process in terms of capacity. This is due to the simplicity of the process, performance characteristics, and scale control (Kalogirou, 1997b). A disadvantage of MSF is that precise pressure levels are required in the different stages; therefore, some transient time is required to establish the normal running operation of the plant. This feature makes the MSF relatively unsuitable for solar energy applications unless a storage tank is used for thermal buffering. Lv = average latent heat of vaporization (kJ/kg). c = mean specific heat under constant pressure for all liquid streams (kJ/kg-K). N = total number of stages or effects. Th = top brine temperature (K). TbN = temperature of brine in the last effect (K). Tb1 = temperature of brine in first effect (K). Ld ybn - yo where ybN = mass fraction of salts in brine in the last effect (dimensionless). yo = mass fraction of salts at zero recovery (dimensionless). Mr = mass rate of recirculated brine (kg/h). To = environmental temperature (K). Estimate Mf /Md ratio for an MSF plant, which has 35 stages, brine temperature in first effect is 71°C, and the temperature of the brine in the last effect is 35°C. The mean latent heat is 2310 kJ/kg and the mean specific heat is 4.21 kJ/kg-K.
Moustafa et al. (1985) report on the performance of a 10 m3/d solar MSF desalination system tested in Kuwait. The system consisted of 220 m2 parabolic trough collectors, 7000 L of thermal storage, and a 12-stage MSF desalination system. The thermal storage system was used to level off the thermal energy supply and allowed the production of freshwater to continue during periods of low solar radiation and nighttime. 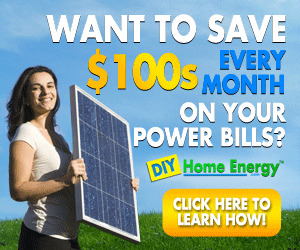 The output of the system is reported to be over 10 times the output of solar stills for the same solar collection area. The MEB process shown in Figure 8.6 is also composed of a number of elements, which are called effects. The steam from one effect is used as heating fluid in another effect, which, while condensing, causes evaporation of a part of the salty solution. The produced steam goes through the following effect, where, while condensing, it makes some of the other solution evaporate, and so on. For this procedure to be possible, the heated effect must be kept at a pressure lower than that of the effect from which the heating steam originates. The solutions condensed by all effects are used to pre-heat the feed. In this process, vapor is produced by flashing and by boiling, but the majority of the distillate is produced by boiling. Unlike an MSF plant, the MEB process usually operates as a once-through system without a large mass of brine recirculating around the plant. This design reduces both pumping requirements and scaling tendencies (Kalogirou, 1997b). 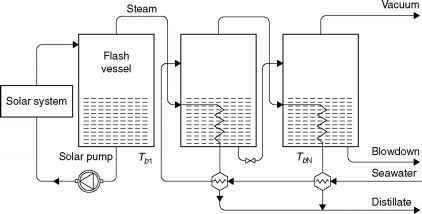 FIGURE 8.6 Principle of operation of a multiple-effect boiling (MEB) system. effect, which is at a lower pressure and receives its feed from the brine of the first effect. This process is repeated all the way through (down) the plant. The distillate also passes down the plant. Both the brine and distillate flash as they travel down the plant due to progressive reduction in pressure (Kalogirou, 1997b). There are many possible variations of MEB plants, depending on the combinations of heat transfer configurations and flow sheet arrangements used. Early plants were of the submerged tube design and used only two or three effects. In modern systems, the problem of low evaporation rate has been resolved by using thin film designs with the feed liquid distributed on the heating surface in the form of a thin film instead of a deep pool of water. Such plants may have vertical or horizontal tubes. The vertical tube designs are of two types: climbing film, natural, and forced circulation type or long tube vertical (LTV), straight falling film type. In LTV plants, as shown in Figure 8.7, the brine boils inside the tubes and the steam condenses outside. In the horizontal tube, falling film design, the steam condenses inside the tube with the brine evaporating on the outside. With multiple evaporation, the underlying principle is to use the available energy of the leaving streams of a single-evaporation process to produce more distillate. where fn = mass rate of distillate obtained by flashing per stage (kg/h). Atn = temperature drop between two effects consisting of the heat transfer temperature difference and an augmented boiling point elevation (K). FIGURES.7 Long tube vertical MEB plant. where e = boiling point rise augmented by vapor fictional losses (K). Att = terminal temperature difference in feed heater condenser (K). a thin film over the horizontally arranged tube bundle in each effect. In the top (hottest) effect, steam from a steam boiler or a solar collector system condenses inside the tubes. Because of the low pressure created in the plant by the vent-ejector system, the thin seawater film boils simultaneously on the outside of the tubes, thus creating new vapor at a lower temperature than the condensing steam. The seawater falling to the floor of the first effect is cooled by flashing through nozzles into the second effect, which is at a lower pressure. The vapor made in the first effect is ducted into the inside of the tubes in the second effect, where it condenses to form part of the product. Furthermore, the condensing warm vapor causes the external cooler seawater film to boil at the reduced pressure. The evaporation-condensation process is repeated from effect to effect in the plant, creating an almost equal amount of product inside the tubes of each effect. The vapor made in the last effect is condensed on the outside of a tube bundle cooled by raw seawater. Most of the warmer seawater is then returned to the sea, but a small part is used as feedwater to the plant. After being treated with acid to destroy scale-forming compounds, the feedwater passes up the stack through a series of pre-heaters that use a little of the vapor from each effect to raise its temperature gradually, before it is sprayed into the top of the plant. The water produced from each effect is flashed in a cascade down the plant so that it can be withdrawn in a cool condition at the bottom of the stack. The concentrated brine is also withdrawn at the bottom of the stack. The MES process is completely stable in operation and automatically adjusts to changing steam conditions, even if they are suddenly applied, so it is suitable for load-following applications. It is a once-through process that minimizes the risk of scale formation without incurring a large chemical scale dosing cost. The typical product purity is less than 5 ppm total dissolved solids (TDS) and does not deteriorate as the plant ages. Therefore, the MEB process with the MES type evaporator appears to be the most suitable for use with solar energy. Unlike the MSF plant, the performance ratio for an MEB plant is more rigidly linked to and cannot exceed a limit set by the number of effects in the plant. For instance, a plant with 13 effects might typically have a PR of 10. However, an MSF plant with a PR of 10 could have 13-35 stages, depending on the design. MSF plants have a maximum PR of approximately 13. Normally, the figure is between 6 and 10. MEB plants commonly have performance ratios as high as 12 to 14 (Morris and Hanbury, 1991). The main difference between this process and the MSF is that the steam of each effect travels just to the following effect, where it is immediately used for pre-heating the feed. This process requires more complicated circuit equipment than the MSF; on the other hand, it has the advantage that is suitable for solar energy utilization because the levels of operating temperature and pressure equilibrium are less critical. A 14-effect MEB plant with a nominal output of 3 m3/h coupled with 2672 m2 parabolic trough collectors (PTC) was reported by Zarza et al. (1991a, 1991b). The system is installed at the Plataforma Solar de Almeria in southern Spain. It also incorporates a 155 m3 thermocline thermal storage tank. The circulated fluid through the solar collectors is a synthetic oil heat transfer fluid. The PR obtained by the system varies from 9.3 to 10.7, depending on the condition of the evaporator tube-bundle surfaces. The authors estimated that the efficiency of the system can be increased considerably by recovering the energy wasted when part of the cooling water in the final condenser is rejected. Energy recovery is performed with a double-effect absorption heat pump. El-Nashar (1992) gives details of an MES system powered with 1862 m2 evacuated tube collectors. The system is installed in Abu Dhabi, United Arab Emirates. A computer program was developed for the optimization of the operating parameters of the plant that affect its performance, i.e., the collector area in service, the high temperature collector set point, and the heating water flow rate. The maximum daily distillate production corresponding to the optimum operating conditions was found to be 120 m3/d, which can be obtained for 8 months of the year. Exergy analysis, based on actual measured data of the MES plant installed in the solar plant near Abu Dhabi, is presented by El-Nashar and Al-Baghdabi (1998). The exergy destruction was calculated for each source of irreversibility. The major exergy destruction was found to be caused by irreversibilities in the different pumps, with the vacuum pump representing the main source of destruction. Major exergy losses are associated with the effluent streams of distillate, brine blowdown, and seawater. Exergy destruction due to heat transfer and pressure drop in the different effects, the pre-heaters, and the final condenser and in the flashing of the brine and distillate between the successive effects represents an important contribution to the total amount of exergy destruction in the evaporator. is thus increased and the steam can be used to provide energy to the same stage it came from or to other stages (Mustacchi and Cena, 1978). As in a conventional MEB system, the vapor produced in the first effect is used as the heat input to the second effect, which is at a lower pressure. 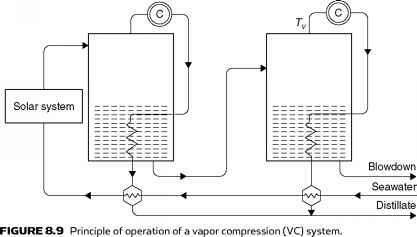 The vapor produced in the last effect is then passed to the vapor compressor, where it is compressed and its saturation temperature is raised before it is returned to the first effect. The compressor represents the major energy input to the system, and since the latent heat is effectively recycled around the plant, the process has the potential for delivering high PR values (Morris and Hanbury, 1991). Parametric cost estimates and process designs have been carried out and show that this type of plant is not particularly convenient, unless it is combined with an MEB system. Further, it appears that the mechanical energy requirements have to be provided with a primary drive, such as a diesel engine, and cooling the radiator of such an engine provides more than enough heat for the thermal requirements of the process, making the solar collector system redundant (Eggers-Lura, 1979). 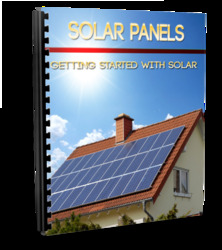 Therefore, the VC system can be used in conjunction with an MEB system and operated at periods of low solar radiation or overnight. 1. Vapor containing brine is carried over into the compressor and leads to corrosion of the compressor blades. 2. There are plant-size limitations because of limited compressor capacities. Thermal vapor systems are designed for projects where steam is available. The required pressure is between 2 and 10 bar, and due to the relatively high cost of the steam, a large number of evaporative condenser heat recovery effects are normally justified. Tv = temperature of vapor entering the compressor as shown in Figure 8.9(K). To = environmental temperature (K). can be attained. Such ratios are almost twice those of a conventional four-effect boiling desalination plant. 2. The performance ratios of the TVC system increase with the number of effects and the entrainment ratio of the thermo-compressor and decrease with the top brine temperature. 3. Exergy analysis reveals that the thermal vapor compression (TVC) desalination plant is the most exergy efficient when compared with the mechanical vapor compression (MVC) and multi-effect boiling (MEB) ones. 4. The subsystem most responsible for exergy destruction in all three desalination systems investigated is the first effect, because of the high temperature of its heat input. In the TVC system, this amounts to 39%, with the second highest exergy defect being that of the thermo-compressor, equal to 17%. 5. Exergy losses can be significantly reduced by increasing the number of effects and the thermo-compressor entrainment ratio (vapor taken from evaporator and compressed by ejector) or by decreasing the top brine and first-effect heat input temperatures.